​Miharashikan is located at 3,200 meters and at the 7th Station on the Subashiri Trail. This mountain hut is located just above the halfway point between the Subashiri 5th Station and the summit. It marks the second of two 7th Stations on the Subashiri Trail. The summit from Miharashikan is about 90-120 minutes without breaks. Mountain huts on Mt. Fuji were originally built as emergency shelters and exist to this day as shelters from harsh mountain conditions. All huts offer simple dorm style accommodation. During peak season, expect minimum space and privacy. It is common to be sleeping shoulder-to-shoulder with other guests. Because the mission of the huts is to provide safety and shelter to as many hikers as possible, it is not possible to pay for extra space. The huts provide the essential shelter and food you need to reach Mt. Fuji's summit. Subashiri Trail Map: Miharashikan is located at the Old 7th Station​. Huts on Mt.Fuji are a unique cultural experience. Here are a few tips for a smooth trip. Make your best effort to arrive by 6:00 pm. It is recommended to leave Subashiri 5th Station between 11am and noon. Dinner is served inside a large tatami matted room, with low table seating. Pack it in, pack it out. There are no trash cans. All personal trash must be packed out and disposed of off the mountain. Futon with blankets and pillows are provided by the mountain hut. The sleeping quarters have bunk beds with each level fitting 20-30 people. Going to the bathroom can be a challenge involving stepping over other guests and climbing down the bunk bed ladders. Be careful! Sleeping arrangements are determined based on the check out time of each hiker. Guests who are attempting a sunrise hike will be grouped together as best as possible from hikers who are watching the sunrise from the hut. 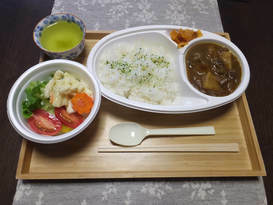 Japanese curry rice with a couple of side dishes such as pickled vegetables and salad. Japanese green tea or water is served with dinner. A vegetarian curry option is available. Vegetarian requests can be made within the booking form. For guests attempting to watch the sunrise from the summit, breakfast is given as a packed "bento". This can be carried with you to eat on your way to or at the summit. 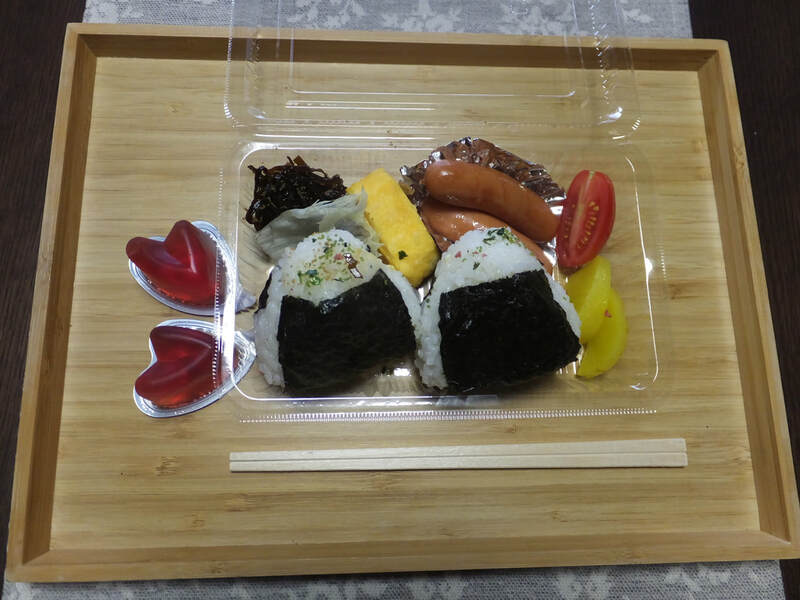 Two onigiri with pickled vegetables and a couple of sausages are included in the bento. 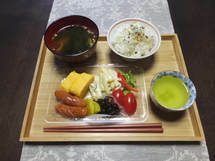 For guests viewing the sunrise from Miharashikan, a breakfast of rice, seaweed, sausages and miso soup is provided in the dining hall after sunrise. Food may vary depending on food availability at the hut.